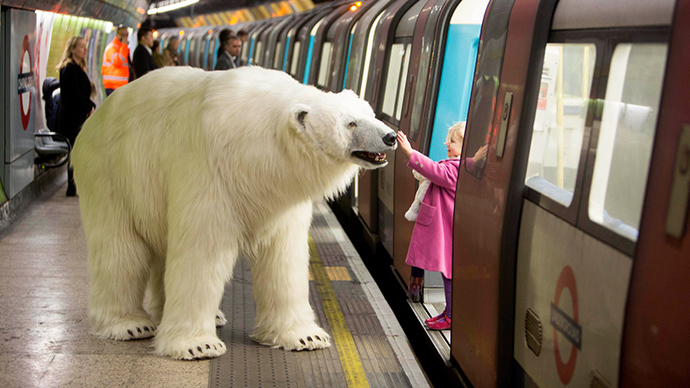 Commuters on the London Underground got a chilly Arctic shock this morning when an 8-foot polar bear was spotted on Tube platforms and in the capital's streets and parks. Tube-goers, kids and London residents strolling through the park got a fright, seeing the furry intruder making appearances at Charing Cross, South Bank and Hampstead Heath as they made their way to work and school. Despite looking like a wild and fearsome Arctic beast, however, the bear was actually part of a PR campaign to promote a new television show, “Fortitude"which boastsan all-star cast including 'The Killing's uber-cool Danish detectiveSofie Gråbøl,Academy Award nominee StanelyTucci, acting legend Michael Gambon and Christopher Ecclestone. The 8-foot tall, fully animated bear, which features a staggering 90 square feet of fake fur, was created by a team of Hollywood special effects experts, and took 19 prop makers eight weeks to design and build the replica animal. Some commuters were genuinely frightened, while others were amused and curious. Many had to do a double-take, even after being told the bear was not, in fact, real. The bear is fitted out with cameras which allow the two operating puppeteers inside to follow its movements and see out of the front. The puppeteers, who spent three years working as the famous leading horse Joey in the West End’s “War Horse,” studied footage of polar bears and spent five days rehearsing to make the movements as realistic as possible. Fortitude, which premieres January 29, is set in the Arctic wilderness, and the TV channel said it wanted to bring this to the streets of London.